There seems to be some confusion within the modern Christian community concerning the commandment to “Remember the Sabbath day and keep it holy” (Exodus 20:8). We cannot just ignore this commandment, since it is the Fourth of the Ten Commandments, but do we have to follow it, like the Old Testament Jews did? Let’s see if the New Testament provides clear instructions concerning this question. In Matthew 12:8, Jesus said, “For the Son of Man is Lord even of the Sabbath.” The clear implication here is that whatever Jesus said about the Sabbath is true and allowable for all, regardless of prevailing Jewish tradition. Jesus also said that “…it is lawful to do good on the Sabbath (Matthew 12:12).” It would seem to follow, then, that “doing good” would include enjoying the blessings and favor of God on the Sabbath and giving Him praise and glory for them. And, in Mark 2:27, Jesus declared that “The Sabbath was made for man, and not man for the Sabbath.” In other words, the Sabbath was given to benefit man, not to rule over him. Thus, healing the sick, tending livestock, and harvesting grain (to use some of the examples used against Jesus to charge him with breaking the Law), as well as doing any “good” thing, such as teaching in the synagogue (Luke 13:10 and Acts 18:4), are allowed on the Sabbath. In Colossians 2:14-21, Paul wrote: “He blotted out the handwriting of ordinances that was against us and contrary to us, and He took it out of the way, nailing it to the cross. And having disarmed authorities and powers, He made a show of them openly, triumphing over them by the cross. Therefore let no one judge you regarding food, or drink, or in respect of a holy day or new moon or Sabbath days. These are shadows of things to come, but the substance belongs to Christ. Do not let anyone cheat you of your reward by delighting in false humility and the worship of angels, dwelling on those things which he has not seen, vainly arrogant due to his unspiritual mind, and not supporting the head, from which the entire body, nourished and knit together by joints and sinews, grows as God gives the increase. Therefore, if you died with Christ to the elementary principles of the world, why, as if you were living in the world, do you subject yourself to legalistic rules? “Do not touch! Do not taste! Do not handle!” These all are to perish with use and are aligned with the commandments and doctrines of men (Italics mine).” Read carefully and you will see three key and telling points made here: 1) Jesus nailed to the cross the traditional, Jewish requirements re. the Sabbath; 2) the traditional, Jewish requirements re. the Sabbath were mere shadows of things to come, so they perished after they had served their purpose among the Old Testament Jews (i.e., when Jesus, who is the substance of these requirements, appeared); and 3) the Sabbath requirements are no longer in effect for those who are in Christ Jesus, including both Jews and Gentiles; they have expired. So, are we required to follow the practices of the Old Testament Jews concerning the Sabbath? The biblical answer is, emphatically, “No!” [For the record, this is why the New Testament church felt free to change the “worship day” of the Christian church from Saturday to Sunday (Acts 20:7)]. But, does this mean that we should ignore the Sabbath entirely? I don’t think so. 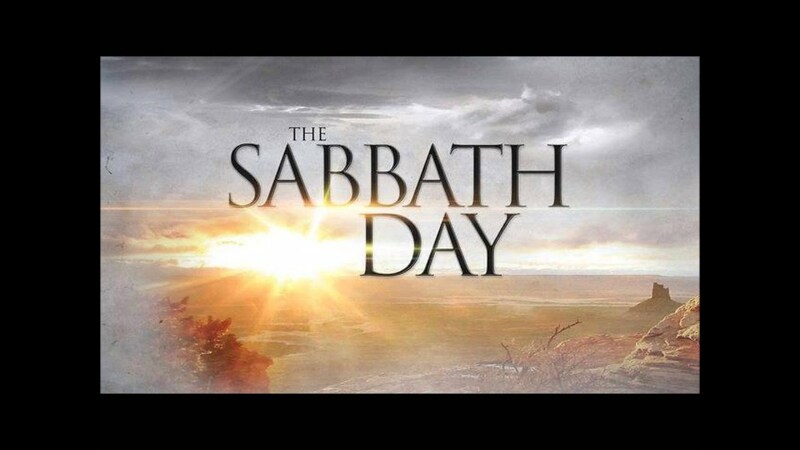 God established the seventh day as a day of rest for mankind (Exodus 20:9-10 and 23:12), and as such, a weekly Sabbath would certainly serve us well, in accord with Mark 2:27, and it would be exercising wisdom. Moreover, the Judaic and Christian practice of gathering for worship on the day of rest is a way of obeying Hebrews 10:25 which says, “Let us not forsake the assembling of ourselves together, as is the manner of some, but let us exhort one another, especially as you see the Day approaching.” So, let us remember the Sabbath by observing a weekly day of much-needed rest and by assembling together regularly to give God all the glory that is due Him. As Christians, these two practices should be our custom. This entry was posted in Biblical Teachings and tagged Christ, Christian, commandment, day, Exodus, glory, God, Jesus, Jew, Old Testament, remember, Sabbath, Ten Commandments.